Mabinogi Duel is a tactical trading card game from Nexon. It has a unique card battle system where a player relies on resources to “summon” creature cards and launch spells. There are no card reshuffles or random draws. A player has complete control over his cards, provided there are enough resources to summon them. The game has brilliant Mahnwa style card artwork, peppered with dazzling Bokeh. If you loved playing Magic the Gathering, then you will love everything about this game. Reaching a new level increases your hero’s HP. You can choose to press the level up button when your player’s HP is slightly lower than the opponent’s HP. I personally don’t wait for my HP to go low and level up immediately to keep my HP high. You may have your own level-up strategy, but just make sure your hero’s HP shouldn’t be lower than 20. Your opponent will summon stronger cards that have a high attack rate and if they attack your hero directly, then his HP will be reduced considerably, and may even reach zero in case HP is 10 or below. You can also cast “Potion of Life” spell card along with leveling up to keep your hero’s HP always higher than your opponent’s HP. You need to summon creature cards to your battlefield first to launch an attack to your opponent’s cards placed on his/her battlefield. Keep engaging your opponent by summoning stronger cards. They can act as a shield against enemy card attacks. If there are few cards placed on your battlefield, some of the enemy creature cards will start attacking your hero directly, which will decrease your hero’s HP. Just make sure you have the best and the strongest cards are placed opposite the enemy cards. Keep opponent’s cards busy and go for the assault. 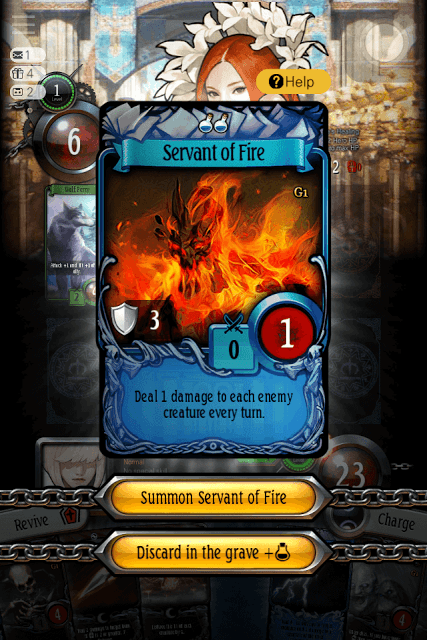 The Servant of Fire card can deal damage to each enemy creature card placed on the battlefield in every turn, but its HP is only 1. It can be easily vanquished if the opponent brings a higher attack card on the battlefield. The best strategy would be to keep it in your deck until you level up. If you level up to 2 the card’s HP will increase to 4. If you max out your level, then the card’s HP will increase to 7. Use it when you have leveled up to 2 or 3. After summoning it will deal 1 point damage to each enemy creature card placed on the battlefield in every turn. It can be quite a useful addition to your deck because it attacks all slots of your opponent’s battlefield. The Revive button lets you recall destroyed cards back to the battlefield. However, there’s a cost for using “revive”. You will have to sacrifice some health points to bring your cards back to life. Use revive when half of the cards have been used or destroyed by your opponent, but before that make sure you have leveled up to 2 or 3. Leveling up will increase your HP. With an increased HP, you can afford to sacrifice some health points to revive your destroyed cards. Keep your HP high all the time. Once your HP hits a single digit, your hero is in danger zone and one direct hit from an opponent’s strong creature card or a spell can eliminate him. The Battle Screen can be divided into various parts. Understanding the battle screen is one of the most important steps to understand how the game works. You can find available resources beside your hero’s portrait. These resources are Gold, Dark/Light/Nature and Mana. You will need resources to summon creature cards to the battlefield or cast spells to defeat opponent’s hero. Tapping on the charge button will add more to the total number of resources. Remember: Charge button grants a random resource. Just below the hero portrait is the “revive” button. Tap this button to recall used up cards. All spell cards that you have used and creature/resource cards that have been destroyed by the rival’s cards will be brought back to life. You may tap on an opponent’s card to know more about its special skills, attack and HP. 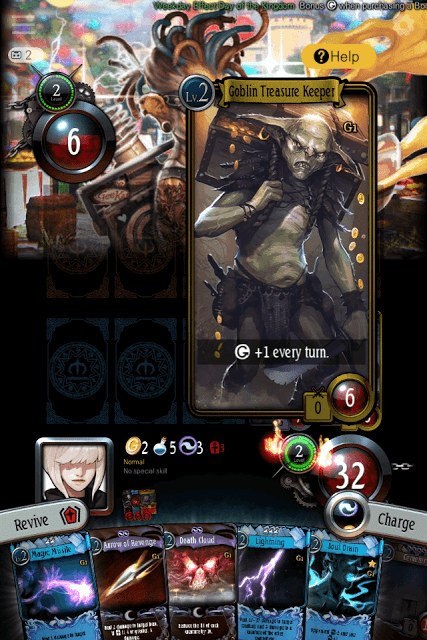 You can also tap on a card in your deck to enlarge it. Press the “Help” button above the enlarged card to know more about it. Your hero’s health or HP is shown on the right side of the screen, just above the “charge” button. You should make sure it does not reach zero. You can also see a number on the opposite camp as well. It’s your opponent’s HP. Your aim is to reduce your opponent’s health to zero to win the card battle. Just above your hero’s HP is the level meter. Keep summoning monsters and casting spells to earn EXP and fill the meter. When it charges up fully, you will be able to level up. A “Level Up” banner will be displayed when the meter gets charged up. Tap on it to level up your hero. The max level a player can reach is 3 in a card battle session. Card battle level-ups have their own benefits. Reaching level 2 or 3 will allow players to perform 2 and 3 actions in each turn respectively. An action is denoted by a flame that keeps circling around the level meter. If two flames revolve around a level meter, it means you can perform two actions. Actions include summoning a creature card or any other card, charging resources, reviving used cards, leveling up etc. 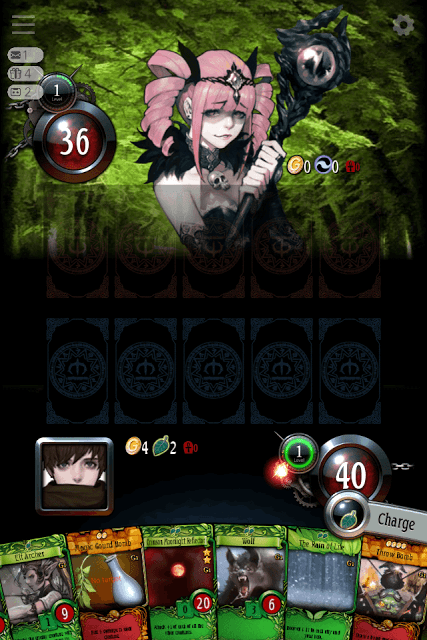 So if you are at level 2 and you have summoned a card and charged resources, you have performed two actions in a turn. Perform actions wisely and make sure at least one action is used up in bringing key creature or spell cards to the battlefield. You can charge resources when you feel the need to do it. You may even summon resource cards or creature cards that add 1 resource in every turn. For example: The Mud Shaman card can attack and has the special skill that grants 1 mana in each turn. When you reach a new level, a card’s HP and attack points will increase. However, with each new level, your cards will require more resources. Before summoning cards and leveling up, tap on each card in your deck and note down the number of resources it will require when you reach level 2 and 3. The resource requirement information can be seen at the top of a creature or spell card. Tap on the “Help” button above the enlarged card to check the number of resources it will need in each level. Using help also reveals increased HP and attack rate per level. Make sure you keep charging up resources by pressing the charge button every time you get an opportunity. This may help you use stronger cards at a higher hero level. But don’t just keep pressing the charge button. The resources you will receive are randomly generated, so keep a balance of card summons and resource generation. Creature Cards: They can attack rival creature cards and your opponent. When summoning a creature card, check its attack value and HP. 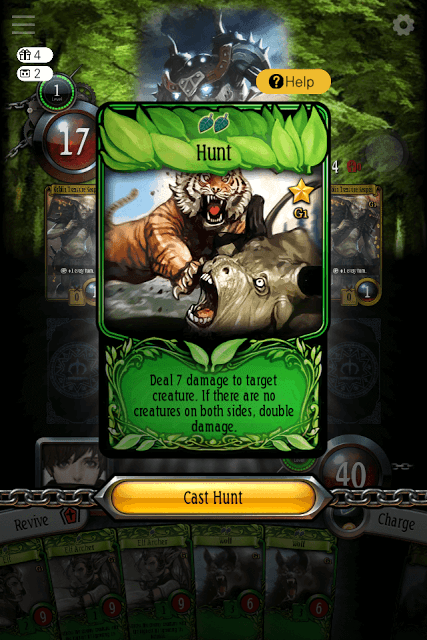 A creature card’s HP can be seen at the bottom-right corner of the card. The attack value can be seen just beside HP. Also, check how many resources it will need to be summoned to the battlefield. Some cards require less number of resources while others require more. Some creature cards grant additional attack, defense or resource benefits. 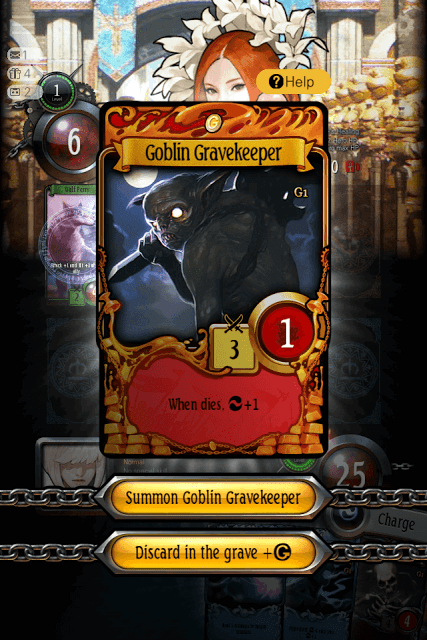 For example the Goblin Gravekeeper card will grant one dark resource after it gets destroyed in battle. Before summoning a creature card, tap on it to know its attack, special skills HP and the resources it will use. Resource Cards: These cards grant an extra resource in every turn. The Blue Moonlight Well is a perfect example of a resource card. Some creature cards like the Mud Shaman also grant resource in every turn. Resource cards have HP, most of them have to be summoned to the battlefield and can be destroyed once their HP is reduced to 0. These cards allow you to cast a spell on your opponent’s card or on him. Some spell cards can also reduce opponent’s resources. Some cards deal damage to a target creature card, but there are a few spell cards that deal direct damage to your opponent’s hero. The “Arrow of Revenge” card is one example. You can use this card to reduce your opponent hero’s HP by 2. After reaching level 3, the card will deal 3 points of damage to the opponent’s hero. Use such spell cards wisely. You may save it for the final encounter, when the opponent’s HP hits single digit. Look for daily login rewards. Some of them may grant a booster pack that may contain a strong card. On the 4th day login reward, I received Gold booster that contained a powerful creature card. On your home screen, swipe right to bring up the rewards menu. You may also receive Gold and Crystals as part of daily logins and attendances. If you are planning to build your own deck, make sure you have a balanced deck consisting of creature cards, resource cards and spell cards. If you are not too confident about your deck building skills, then leave it to AI. Go to Binder and tap on “Auto” to get your deck built by the computer. At the start of play you can choose a starter pack from two packs – Dark and Light. Choose your starter pack wisely. You can then build a deck from the starter pack, add or remove cards. You can purchase extra cards from the card shop. Don’t miss gold booster that costs 999 gold. Since gold is easy to get, you can afford this booster pack. 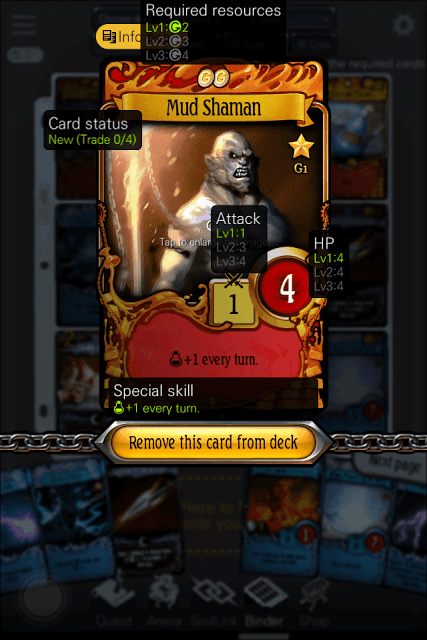 You will also get free creature, resource or spell cards as daily login rewards. Complete more daily missions (available under “Quest”) to get extra gold. You will have to complete all stages of a mission to get 500 gold.